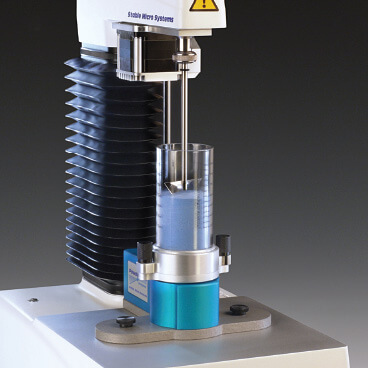 Stable Micro Systems use the test frame and vertical drive system provided by a universal Texture Analyser, and add the rotational drive and software functionality to form the Powder Flow Analyser – an accurate and reliable method of measuring the flow characteristics of powders. 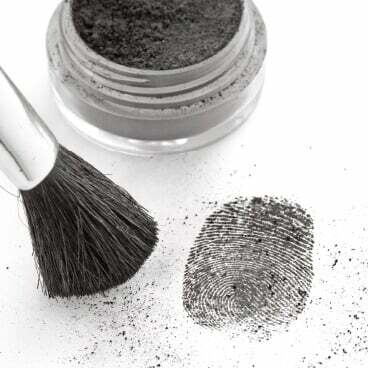 The Powder Flow Analyser can be purchased as a completely new working system, or you can take your existing Texture Analyser and attach the Powder Flow Analyser unit to extend your range of testing solutions from powders to end products. 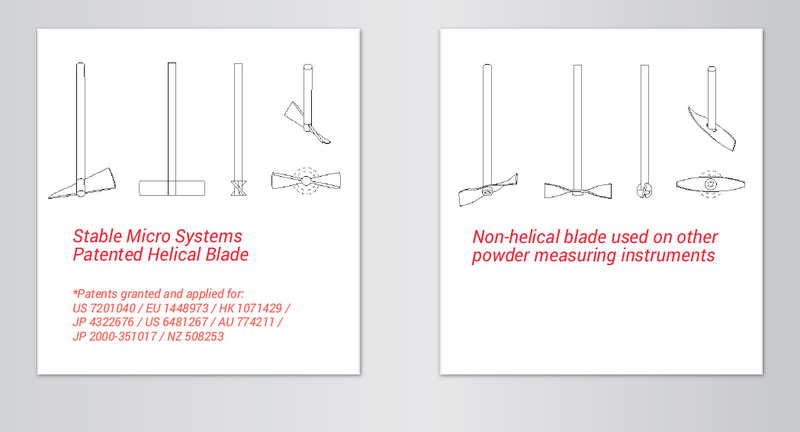 A patented helically-machined rotor can be programmed to move through a powder column in different ways, depending upon the characteristic that is to be measured. 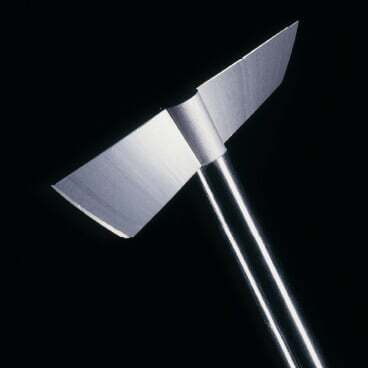 Due to the unique precision profile of the rotor's blade, the sample can be physically displaced in many different ways. 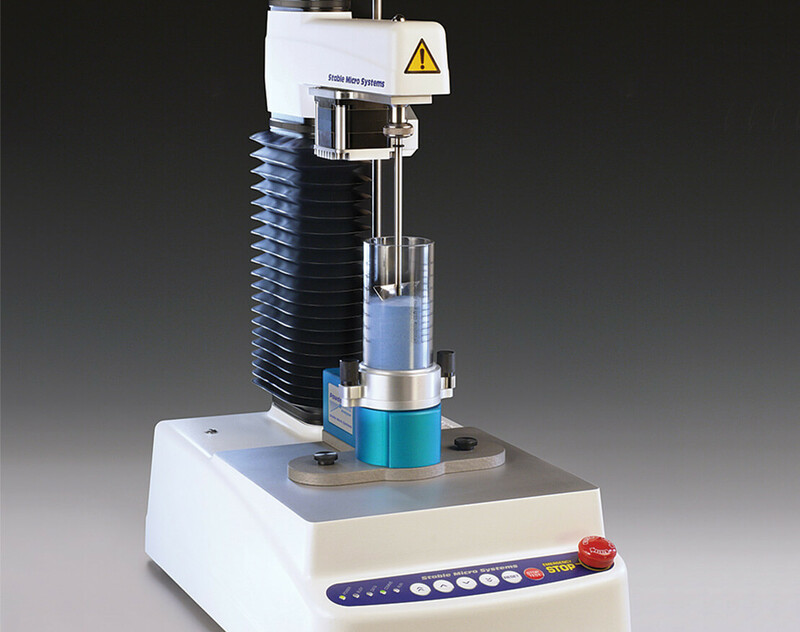 The Test Settings of blade path angle and tip speed determine the mode of Controlled Flow achieved within a sample column. 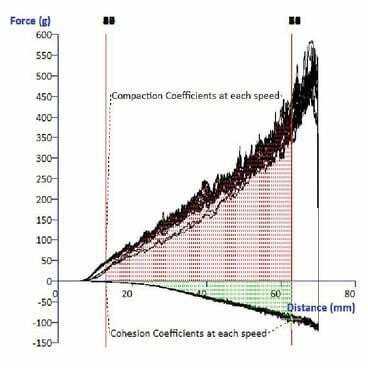 During the test, axial force, time and distance are measured by a sensitive transducer and data is displayed and analysed in real time by Exponent software. 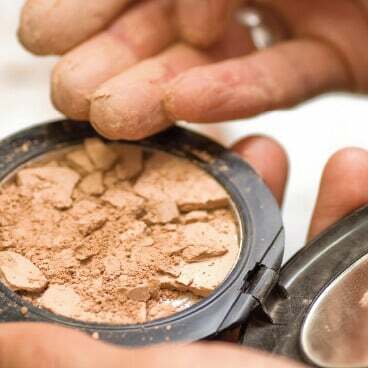 Sample results can be ranked and compared to assess the impact of external conditions including humidity and moisture content, surface properties, electrostatic charge and particle or granule size, shape and distribution. 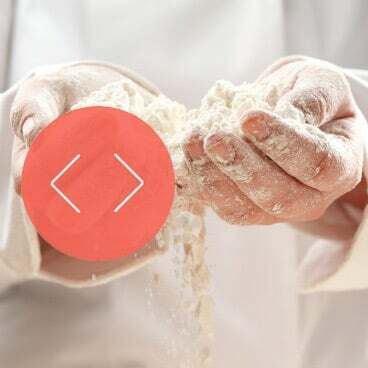 Manufacturers can assess and avoid typical problems such as batch and source variation of ingredients, caking during storage or transportation and problems with discharging from hoppers or bins. Once programmed, the optimised test can provide identical controlled flow conditions when completing the same test programme. Test Settings can be optimised to show the maximum differentiation between similar products, or to imitate the process or storage handling conditions, experienced by the product. The Powder Flow Analyser is supplied with library tests, so operators can start testing quickly and conveniently after straightforward installation and calibration. Users can, however, fully program the instrument to carry out slicing, shearing, compressing, compacting and aerating cycles in any combination. 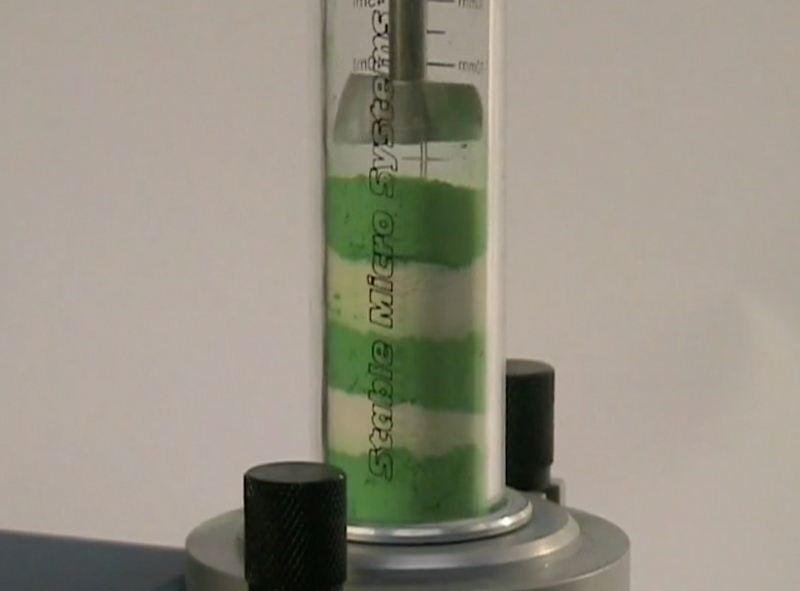 A typical test starts with conditioning the powder column to remove operator loading variation and to normalise the powder column after filling and prior to testing. Data is not captured during this process but this ensures that each sample starts after the same influence and hence provides outstanding reproducibility. 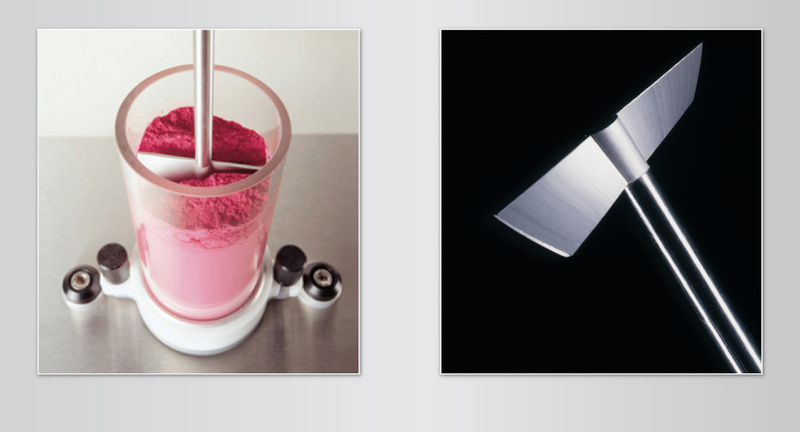 Depending upon the programmed rotation of the blade in terms of path angle, blade direction and tip speed the powder column can be displaced in a number of different ways (from extremely gentle through to aggressive displacement) to suit the process and properties to be measured. 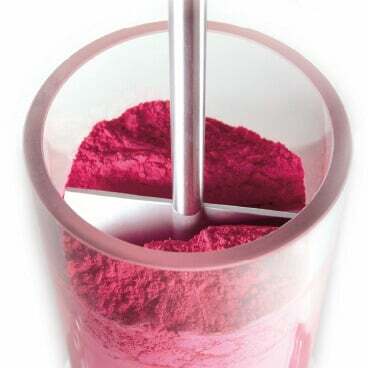 A Lifting/Aerating action allows the powder column to be conditioned, thereby giving independence from sample loading variations. It can also effectively measure particle cohesion and flow behaviour after compaction has been employed. 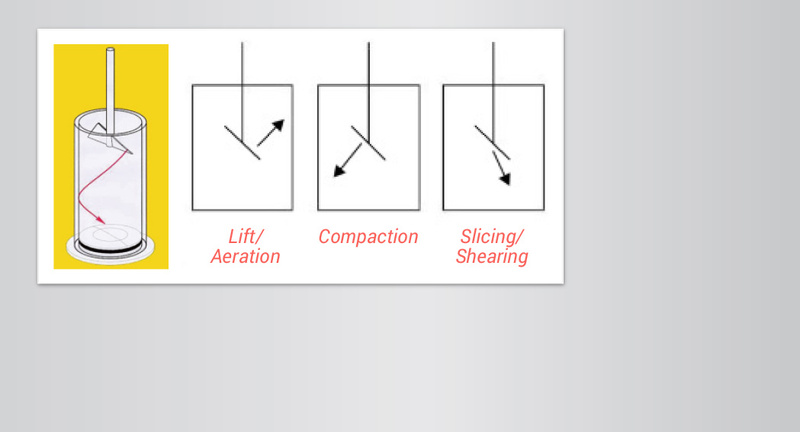 The use of a Compaction/Compressing method allows the measure of flow properties with changing compaction force and flow speed and provides an investigation of caking potential.